JAMMU, Mar 8: National Mazdoor Conference (NMC) and All J&K Low Paid Employees Federation (LPEF) demanded release of pending installment of 2 per cent Dearness Allowance (DA) due from January 1, 2018. President of the National Mazdoor Conference (NMC) Subash Shastri today appealed to the Chief Minister to release the pending installment of 2 per cent DA due from January 1, 2018 in favor of the employees of the State Government and pensioners in view of the decision of Union Cabinet, which has approved the release of 2 per cent DA allowance to Central Government employees and dearness relief to pensioners from January 1, 2018. 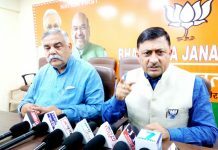 “Release of additional installment of DA by the Central Government is an increase of 2 per cent over the existing rate of 5 per cent of the basic pay/pension, to compensate for price rise”, Shastri said this while addressing NMC workers meet here. Among others who were also present on the occasion included Rajan Babu Khajuria, BS Jamwal, Jaipal Sharma, Ram Singh, Pardeep Kumar, Surinder Kumar, Bhupinder Singh, Ramesh Sharma, Sunil, Swarn Bhagat, Subash Sharma, Tarsem, Suraj Parkash, Sukhdev Singh, Tarseem Sharma, Tilak Raj and Girdhari Lal. Meanwhile, Abdul Majid Khan, President All J&K Low Paid Employees Federation (LPEF) also urged the State Government to release 2 per cent DA installment in favour of employees and pensioners as it will certainly provide relief to them.